Virtual Reality – Fad or Fabulous? Who didn’t spend hours as a child, gazing through their View-Master, clicking around the film cartridges which revealed 3d images of nature, super heroes and classic stories? 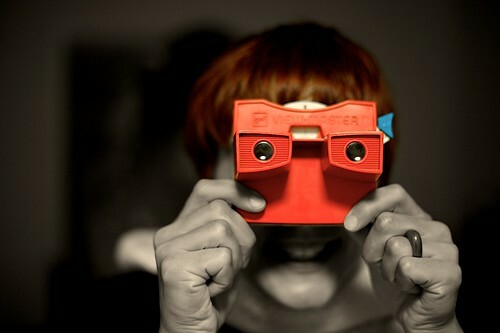 The View-Master allowed us to escape into an imaginative world in a different way to books or television; by holding it up to our eyes, the whole world disappeared as our field of vision was completely taken up by these tiny slides. The world has changed dramatically since my childhood, and technology now allows for an immersive experience light years beyond the simple View-Master of the past. Technology such as the Oculus Rift and the Samsung Gear VR are bringing Virtual Reality out of science fiction, and thanks to the incredibly cheap Google Cardboard Virtual Reality viewer, into the hands of everyday people. In some areas, virtual reality is seen as the natural next step to how we interact with media content, from gaming to movies and more. I have written before on this blog about Augmented Reality, and explained the difference between Augmented Reality (AR) and Virtual Reality (VR). Augmented Reality has lots of potential for education, and free apps such as Aurasma and Daqri have enabled teachers to experiment with different ways to enhance learning using it. However until the introduction of the Google Cardboard viewer, the chance to explore the potentials of VR in education has been extremely limited. Before jumping into a discussion about whether VR is fad or actually fabulous for education, let’s investigate exactly what it is, and what the technology and tools entail. This video, gives a fantastic, simple explanation for those new to the idea of Virtual Reality. Click the image below to access it on the Time website. Put simply, VR is the experience of a computer generated simulation or 3D image, made possible by the use of technology such as a helmet or viewer. The ability to ‘trick’ the mind into thinking that the individual is actually ‘there’ within the environment which is in fact ‘virtual’ is the amazing and fascinating aspect of VR, which removes it from other experiences of media. When viewing a VR App which features a rollercoaster ride, users may feel the same feelings of dizziness and displacement that they would when actually riding the real thing. Of course, the more advanced the VR system, the more fully immersed within the environment the user becomes. Simple apps combined with a Google Cardboard Viewer provide enough immersion to make one feel a little ill, but the lack of audio stimulus and real interactivity limits just how ‘real’ the experience feels. This is a good thing for younger students – being able to pull the viewer away at any moment of discomfort is important. For older or more experienced users of VR, they may wish to trial technologies that provide a much fuller immersion; where sensory stimulation including the sense of touch (e.g. wind blowing through your hair as you fly) and audio (the rushing sound as you soar) as well as the ability to interact with the environment actually makes the computer disappear, as the brain becomes fully engaged with the virtual world. For a deeper explanation about how VR works, a great article that is easy to read is How Virtual Reality Works by Jonathan Strickland. While it seems obvious that gaming will be where a large proportion of development will happen in the VR world, the ability to experience ‘being there’ from the safety of a classroom has obvious appeal for the educator. Having the ability to walk through historical sites, to experience times in history such as World War One or to investigate Outer Space are just some of the most immediate examples of how virtual reality might play a part in learning. The Google Expeditions Pioneer Program and Immersive VR Education sites are currently offering this experience to students – and one can only assume others will follow. For many schools, excursions, school trips and even hands on activities may be limited due to funding or safety concerns; using virtual reality, while not a complete replacement, may allow those students to experience what they would otherwise have never been able. Research has shown that game-based learning environments, virtual worlds and simulations all result in varying levels of positive learning outcomes (Merchant, Goetz, Cifuentes, Keeney-Kennicutt, & Davis, 2014). However, this meta-analysis admits that the research available is limited in different ways. There is also not a great deal of literature available discussing the effectiveness of virtual reality based learning in the context of retention and being able to transfer the learning from the virtual to the real environment (Bossard, Kermarrec, Buche, & Tisseau, 2008). This is not surprising, given the cost of providing virtual reality experiences to this point. With the introduction of Google Cardboard, all of this is about to change. These apps are all available on the Google Play store. There are also apps available for iPhones through iTunes. Google Cardboard is a low tech, cardboard viewer, that holds users’ to smartphone, so that the screen of the device is viewed through the lenses. There are a growing number of free and paid apps that are being made available to be viewed through the viewer, ranging from the aforementioned rollercoaster (not for those who experience motion sickness!! 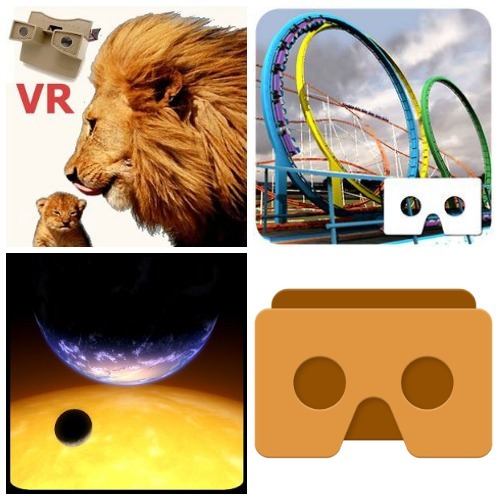 ), an African safari, several space adventures,and the original Google Cardboard app, which features different experiences including a simple animated story, a tour of Versailles, a 3D artefact that can be examined from all angles and the opportunity to fly over the Earth. One of the apps that shows the way VR might potentially link to literature is the beautiful War of Words, which features a reading of Siegfried Sassoon’s poem ‘The Kiss’. This app demonstrates a way VR might be used to engage students in poetry through the immersion in an atmospheric experience that conveys a tone that a simple reading may not provide. Enabling students to almost physically enter the world of the text opens up immense possibilities. A hybrid sitting between the book and the movie, books could include points during the story where the reader is encouraged to put down the physical book and pick up the virtual visor, to experience an adventure along with the characters. Combining the two technologies (book and VR) would enrich the experience, while providing new ways to encourage beginning readers to interpret the text. Although this article in Mashable focuses less on reading and more on the storytelling experience, those who work with disengaged readers can easily make the links between experiencing storytelling of the calibre described here, and the desire to the engage with text that further extends the story. 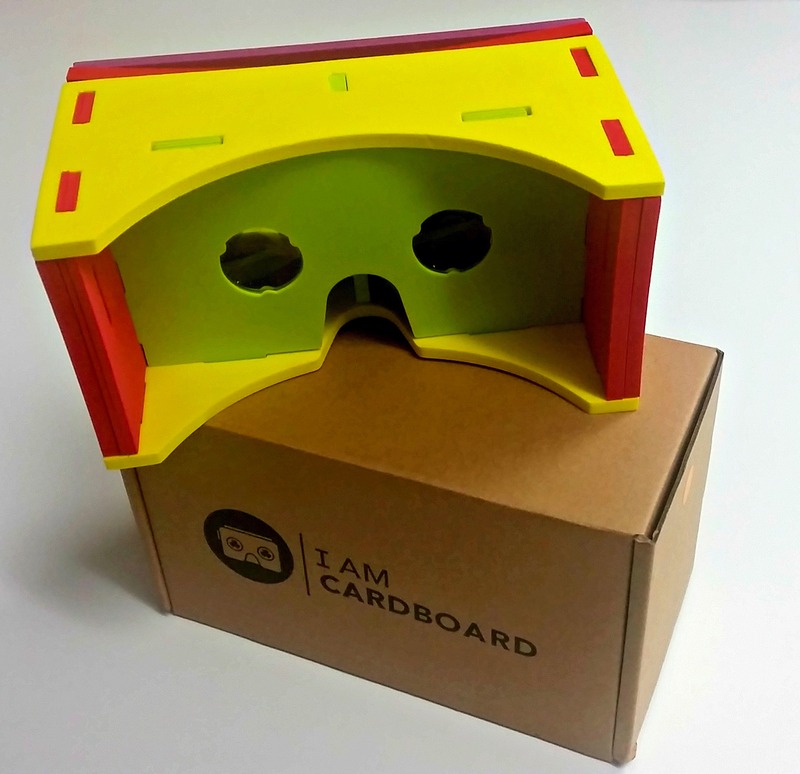 To support the exploration of Virtual Reality, ResourceLink has purchased a set of six I Am Cardboard Viewers, and will be offering them for loan along with our other Makerspace kits. Teachers will need to provide the phones loaded with appropriate apps, however with most students today owning their own mobile, this might just require some pre-planning. Primary schools wishing to explore might choose to host an afternoon where parents are invited to join in with the learning, bringing their mobile phone with them! Some apps work on iPod Touches, however phones provide the best experience, as generally they are more powerful. In the kit, I have included two documents to assist users; one outlining tips for using a Cardboard viewer in the classroom, and one suggesting apps to get users started. True virtual reality and augmented reality technologies will be slower to go mainstream, since the effort to put on glasses of any type means costs and changes in user behavior. When such technologies become seamless and unobtrusive accessories, they will move toward mainstream. 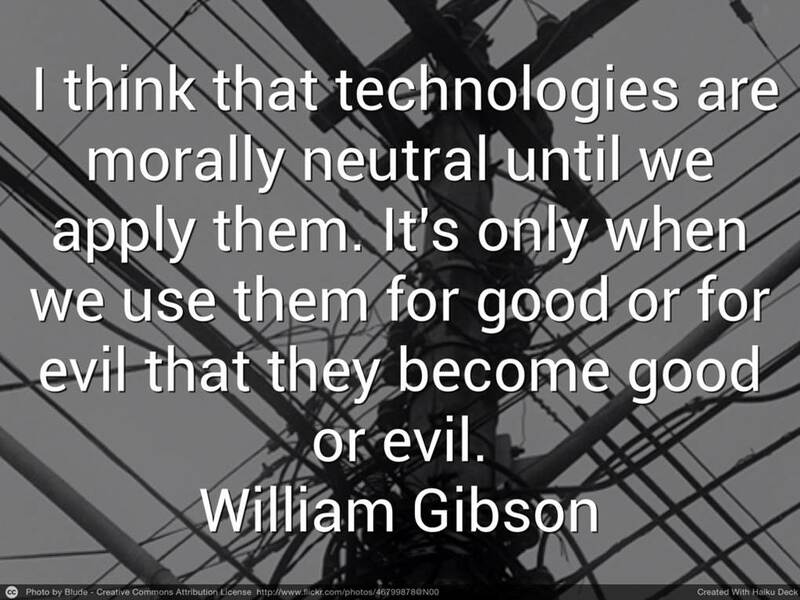 Despite this, teachers, librarians and administrators involved in education are challenged to play with and investigate new technologies. Becoming informed about,and exploring ‘horizon’ technologies such as VR, and observing developing trends in pedagogy helps educators respond more effectively in a changing learning environment, and with students who demand a changing l earning experience. Intrigued and want to know more? I have created a Pinterest Board which has a range of links to apps, articles and research, and if you wish to keep up to date, check out my Flipboard, to which I will be adding articles of interest. For Brisbane Catholic Education staff, the Google Cardboard kits will be available for loan through the Oliver catalogue; simply search the lists for Makerspaces, and you will find it, along with all of our other Makerspace kits and resources which you can book for use. “Oculus Rift – Developer Version – Front” by Sebastian Stabinger – Own work. Licensed under CC BY 3.0 via Wikimedia Commons. “Samsung Gear VR” by http://www.flickr.com/people/pestoverde/ – http://www.flickr.com/photos/pestoverde/15247458515. Licensed under CC BY 2.0 via Wikimedia Commons. “Assembled Google Cardboard VR mount” by othree – Google Cardboard. Licensed under CC BY 2.0 via Wikimedia Commons. What does it all Meme? The whys and wherefores of a modern communication phenomenon. An internet meme is that thing that everyone is talking about. The blue/gold dress. Charlie bit my finger. LOLCats. Some of the most well known internet memes are the image with a pithy quote overlaid. They can be in turns hilariously funny, insightful or just crude, however they are a contemporary form of communication which many young people seem to instinctively ‘get’ and which leave many adults feeling like they are missing the joke. The term meme was coined in 1976 by Richard Dawkins, in his book The Selfish Gene, as a way of using evolutionary principles to explain the spread of ideas and cultural phenomena such as melodies, catchphrases or fashion. These small units of culture were spread through imitation and innovation upon an original idea – a spread that is similar to a virus, as they go through the processes of variation, mutation, competition, and inheritance, each of which influences a meme’s reproductive success. 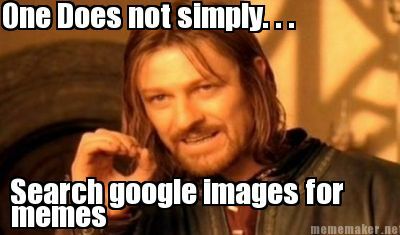 The meme above, known as ‘One does not simply’ is a good example. 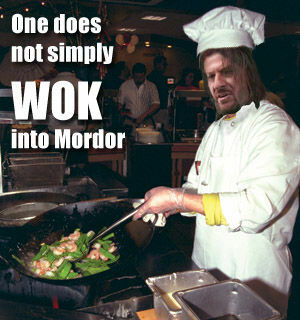 Drawn from a quote from The Lord of the Rings, where the character Boromir makes the quote “One does not simply walk into Mordor”. 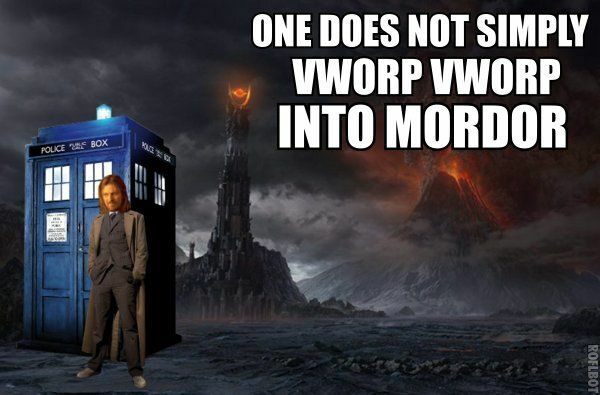 Now, the phrase “one does not simply” is well known enough that memes such as the one shared at the beginning of this post can be applied to a wide range of scenarios, with an underlying understanding of the context – that whatever is being suggested is no simple matter. It is this rich intertextuality that makes memes both worthwhile, yet challenging. One must know the context of the initial post before the meme truly makes sense, but if the shared understanding is strong enough, the meme becomes a powerful and viral mode of communication. Internet memes, and their viral spread, are an example of participatory culture, as the reproduction, imitation and re-interpretation of these nuggets of society are practices which have become a huge part of contemporary digital culture. In fact, Limor Shifman, in her text Memes in Digital Culture goes so far as to say that we live in an era driven by a hypermemetic logic, where almost every major public event sprouts a stream of memes. He argues that although at first glance they appear to be trivial pieces of pop culture, upon deeper reflection one sees that they play an integral part in some of the defining events of the 21st century. So why do educators need to be aware of memes and their role in communicating culture? They don’t. Educators don’t NEED to be aware of memes, anymore than they must play Minecraft or read Twilight. However, there are several compelling reasons to consider taking the time to think about memes and how they might play a role in teaching – particularly of older students. What appears to be an innocent cow in a field is rendered threatening by the simple addition of the word ‘Soon’…why is this so? Dr Alec Couros argues that the digital participatory culture within which students communicate, socialise and learn provides essential opportunities for information literacy, and suggests that memes are a powerful way of discussing many different aspects of this literacy. He begins by suggesting that students examine memes with a view to understanding how information travels and is distributed online. The viral nature of memes means that whether by merit, messenger or manipulation, a chunk of information/culture/art may be spread via networks at an astonishingly fast pace. Students who understand this are not only more likely to be aware of their responsibilities when sharing online, but are also more prepared for a world where marketing is pervasive. 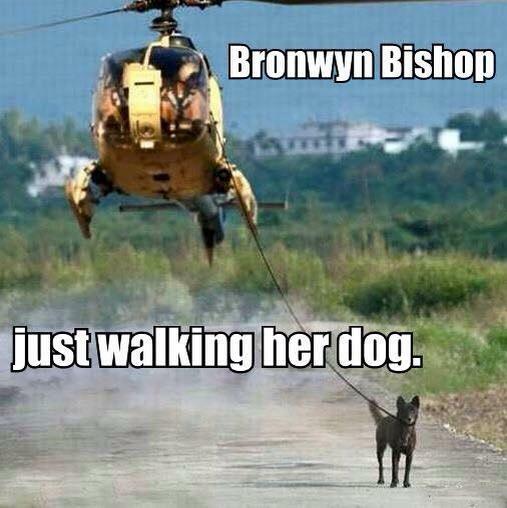 The Australian controversy with our previous Federal Parliamentary speaker is a very recent example of current events becoming a viral meme (helicopters anyone?). 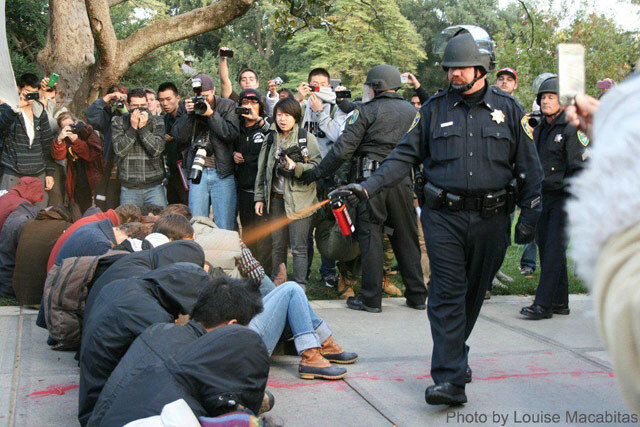 which went viral after the image of a police officer casually pepper spraying a group of Occupy protesters at the University of California was captured in 2011. 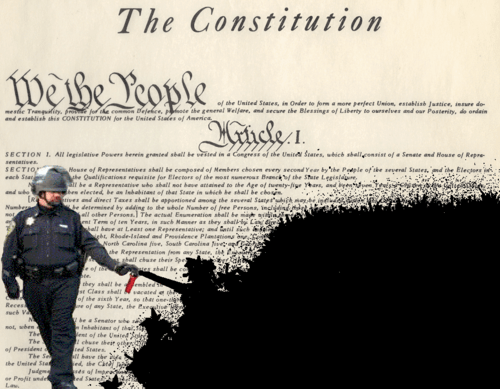 The image was photoshopped into a variety of contexts, which enflamed what was already a very tense political situation, and when the police officer’s contact details were made public online, he was the target of a huge text and email campaign critiquing his actions. 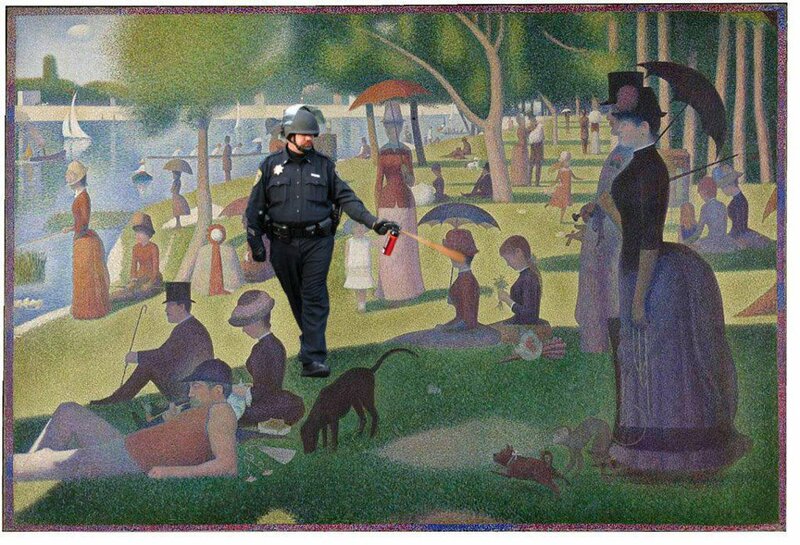 This meme influenced news reports, customer reviews of pepper spray available for sale on Amazon and spawned songs and videos. The repercussions of this single (questionable) action resulted in the resignation of the police chief and the loss of the police officers job, as well as compensation claims and legal suits. The full detail of this meme can be read on Know Your Meme, however it is clear that a much larger and more serious story lies behind what many probably thought was a humorous internet joke. Internet memes are an interpretation of the fad joke that has always been there, however with the power of the crowd and the potential to manipulate and remix in the hands of so many, they have become a much larger part of internet and general culture. It is important to be aware of the complexity behind many of these simple jokes (and be able to enjoy the ones that are indeed just simple jokes). Have you taught using Memes? Please share your experiences and resources in the comments! Gladwell, M. (2002). The Tipping Point: How Little Things Can Make a Big Difference. Boston: Back Bay Books. Shifman, L. (2013). Memes in Digital Culture. Cambridge MA: The MIT Press. AustLit – Australian Literature like you’ve never accessed it before! Every Australian teacher, and any teachers of literature across the world who teach Australian Literature should make themselves aware of AustLit, an amazing resource created by a dedicated team of researchers and indexers based at the University of Queensland, funded by the Australian Government and a range of University and research partners. AustLit’s mission is ‘to be the definitive information resource and research environment for Australian literary, print, and narrative cultures’ – and indeed it is. AustLit is available to patrons of subscribing libraries, educational institutions, other organisations, and individuals. Currently, all registered users of subscribing libraries or institutions have full access to AustLit, which includes registered users of almost all Australian universities, the National Library of Australia, Australian State & Territory Libraries, a number of local council libraries around the country and…ALL STAFF AND STUDENTS OF BRISBANE CATHOLIC EDUCATION!! The decision to subscribe on a system wide level has enabled all BCE students and staff to make full use of this fantastic resource – and this blog post aims to give some insight in to just some of the fantastic resources available to support quality learning and teaching. 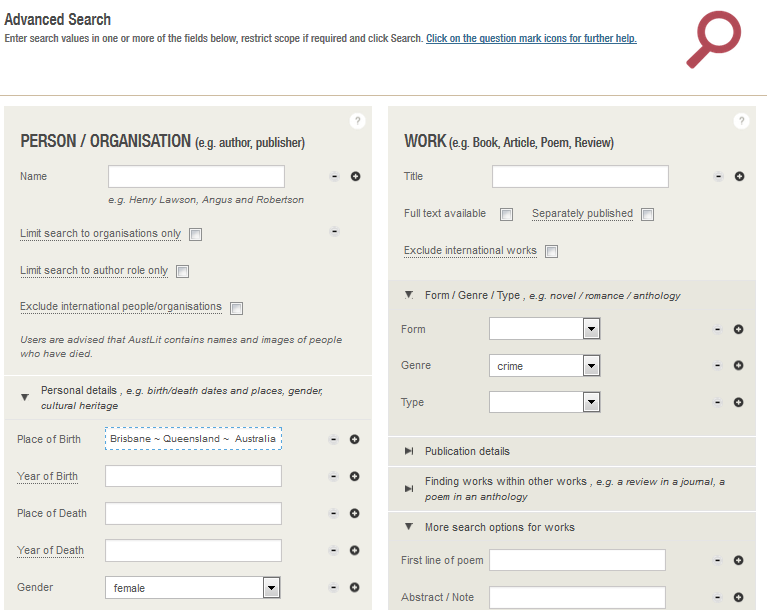 AustLit is a database, and as such it has a powerful search ability to access the 152 000 writers and organisations who have created the over 840 000 accessible works. This includes full text novels, poems, films and TV, children’s and young adult literature, biographies, criticisms and reviews. Understandably, a simple search may not pinpoint the exact work you are looking for, so making use of the Advanced Search capability is a time-saving feature for busy teachers and students. AustLit provides extensive information on how to search effectively, as well as an overview of how to use the built in Boolean Operators and the handy Subject Heading thesaurus. Click on the image to access these and other research trails. BlackWords records information about the lives and works of Aboriginal and Torres Strait Islander writers and storytellers and the literary cultures and traditions that formed and influenced them. BlackWords is the most comprehensive record of Aboriginal and Torres Strait Islander publications available. It includes texts both by and about Aboriginal and Torres Strait Islander writers and literary and storytelling cultures. This resource is magnificent, both for Australians wishing to learn more about Australia’s heritage and our first people, and for those internationally who would like to learn more about the oldest culture on earth. This article, by Dr Jeanine Leane (PDF) outlines what resources are available through BlackWords, and how teachers might use these resources to meaningfully embed Aboriginal and Torres Strait Islander perspectives into the curriculum. Please note that the link to the map of pre-colonial Australia referred to in the article has changed; the map can now be accessed here. Reading Australia was created separately, by the Copyright Agency of Australia. It is a list of over 200 Australian titles, many of which are accompanied by practical teaching resources that align to the Australian Curriculum. In addition to these resources, AustLit has created a series of curated information trails that provide context and supporting information relating to the Reading Australia texts. Click on the image to go directly to Reading Australia. Tip Five: BCE Students and Staff – access AustLit TODAY! As mentioned in the introduction, AustLit is available through many channels, but for Brisbane Catholic Education students and staff, the database is being delivered system wide, with the username and password available via the ResourceLink Portal. Go to the ResourceLink Portal AustLit page, where you will find further resources, as well as useful links and our conditions of use. BCE staff can share access information with BCE students. Simply sign into KWeb and go to the ResourceLink Portal, click on School Access and then Austlit, or go directly using this link, signing in when prompted. AustLit has an active social media presence, as recognised by this recently crowdsourced list of Australian historic fiction; follow them on Twitter @AustLit or stay up to date via their blog at http://www.austlit.edu.au/news/. Have you used AustLit in your learning or teaching? Share in the comments what you did, and how it went – we’d love to hear from you! Celebrate Australia Day – It’s Great to be an Aussie! With the news being filled with tragic and terrible stories of terrorism and violence, it is sometimes difficult to remember that living in Australia we are truly blessed. Why not take time on Australia Day this year to reflect on all of the positive aspects of being an Australian! Use any of the resource ideas below to share with students the ‘good news’ about our young and vibrant country. Did you know that for the 3rd year in a row, Australia has been ranked the happiest of 36 industrialised nations in this OECD survey? Click the image below for a fascinating infographic which compares the Australian way of life with others. READ a great Australian book – choose from this list, or even better, have the students create their own list – compile it on Pinterest or GoodReads and share it with the world! COOK a fantastic Aussie feast – we have all of the cuisines of the world to choose from, and we also have our own local delicacies – bring a plate to share, or pool your favourite Aussie recipes and create an enviable recipe book! SING (or sing along!) to a playlist of great Aussie songs; choose traditional tunes or groove to the JJJ Hottest 100 – an Australia Day tradition. Why not run your own music quiz similar to Spicks and Specks? (This Wikipedia article gives a great explanation for some of the games from the show). WATCH an Australian film or documentary – AustralianScreen has 1065 short clips with teachers’ notes, suitable for students of all ages. Divided into categories such as History, Film and Media, Identity and Culture and more, these clips give insight into many aspects of Australian life. Perhaps your students will be inspired to create their own great Aussie documentary? TRAVEL around Australia – with the internet, you don’t have to leave the classroom to tour our amazing country. Why not plan a virtual Australian trip visiting key historic or geographic sites, or use Are we There Yet? by Alison Lester to inspire Australian travel discussions and activities. Whatever you do, celebrate Australia Day! We have an amazing country, filled with fascinating people, nature and culture – share below in the comments how you plan to spend Australia Day in your classroom! Of course, a lot of things have also changed; and one of the most important updates I made to my workshop was to introduce participants to Haiku Deck. Originally an iPad app, and now available on the web, with future plans for access on other platforms, Haiku Deck is a gorgeously simple slideshow creator, that enables the user to create presentations that easily meet all of the tips for presentations mentioned above. The creators behind the app focus on three words: simple, beautiful and fun. Click this image to view a simple Haiku Deck example. 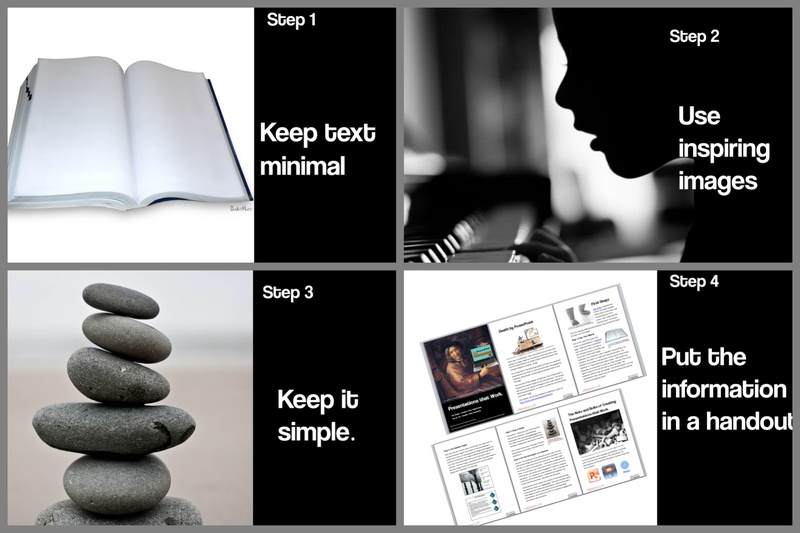 A ‘deck’ or presentation can be created in four easy steps, and the finished result can be shared on social media such as Twitter or Facebook, embedded on a blog, website or in a learning management system, emailed or opened in PowerPoint or Keynote for further editing (if necessary). The steps to create a deck are incredibly easy. The process described below is for the iPad app – but it is very similar using the web-based app, and extremely intuitive. First, click the plus sign in the centre of the bottom of the screen to create a new deck. Then, give your deck a name, and choose a theme. Don’t worry – if the theme doesn’t suit, you can always change it again at any time during the creation process. The different themes run across the top of the iPad screen. Simply scroll through to choose your favourite. The deck creation process is determined by the four images you will see on the left hand side of the screen. These allow you to (from top to bottom) add text, add images, arrange your text and add notes. Adding text is very simple, and the beauty of Haiku Deck is that it encourages you to keep the text to a minimum. Yes, they have made additions, to enable users to input dot points, or blocks of text, however the deck is most powerful when text is used sparingly. 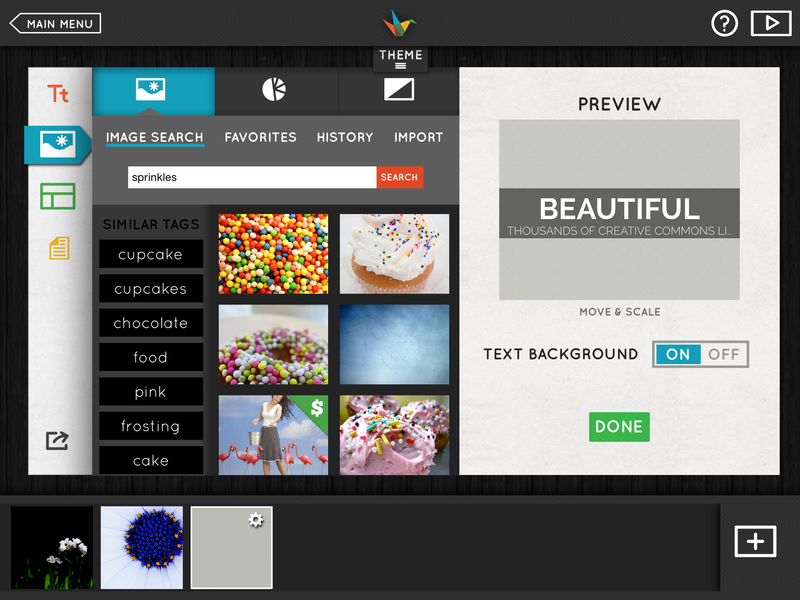 Choose from selected keywords, search with your own keywords or upload your own image! Choosing images is the fun part. Haiku deck cleverly identifies key words in the text on the slide, and automatically allows you to search a database of thousands of images using these words. You can also choose to search using your own key word, or upload your own image. 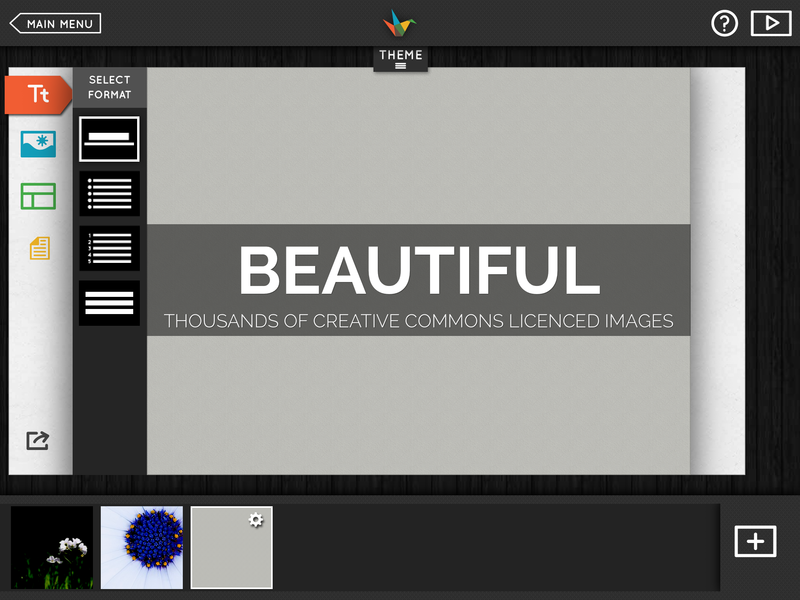 The thing that really stands Haiku Deck apart from other presentation software is that if you choose a Creative Commons Licenced image (read more about this type of image here) it automatically includes the attribution on the slide – saving an enormous amount of time. You can also choose from a range of pre-formatted charts, or choose a solid background colour (handy for those quote slides or for when you do need to include a lot of text). In addition, in the iPad app, you can purchase stock photography right from inside the app, with images costing $1.99 US. Even if you are not wanting to create the entire slideshow in Haiku Deck this automatic attribution is powerful. Why not create a deck of awesome pictures, complete with attribution in Haiku Deck, and then export the slides to PowerPoint or Keynote (say if you wanted to also embed movies, music or other features not currently a part of the Haiku Deck suite). Choose to add a headline and subheading, or add dot points or a block of text. The third stage is to place the text. Here you have a number of options, which are useful for working around the image in order to best combine image and text. Although the options are somewhat limited (you can’t freely place text anywhere you wish on the slide, you must choose one of the set positions), this restriction actually frees the creator, as it enables the focus to be on simply word and image, and speeds the creation process. The fourth step is optional, and is the addition of notes. You can make these notes either private, or you can publish them along with your slides, for sharing with others. This is a much valued addition to Haiku Deck, as it really enables the tool to be used for much longer or more complex presentations, and is a godsend for those of us who get nervous when speaking, and like to have a visual prompt! 1. Prayer/Reflection/Meditation: when you want beautiful images and few words, nothing beats a Haiku Slide deck. Being based in Brisbane Catholic Education, many of our meetings and gatherings begin with a simple prayer or reflection; and often these are required at short notice. Even the most familiar prayer can be given new life when it is paired with amazing imagery. 2. Conference reviews: when you attend a conference, you hear many nuggets of wisdom. 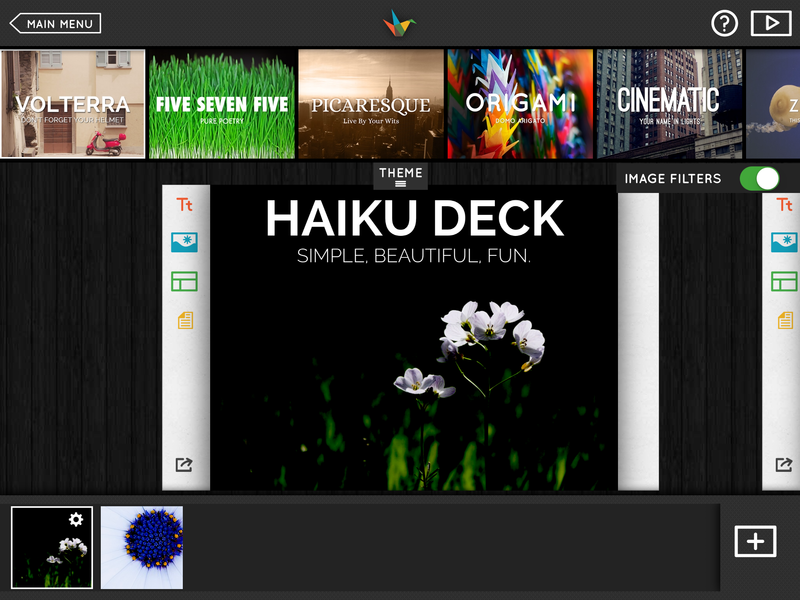 What better way to capture and share these, than by using Haiku Deck. When you return from the conference, and have an amazing looking presentation to share with colleagues, no one will know just how quick and easy it was to create! There are so many other creative ways to use Haiku Deck; young students could easily create a deck for a show and tell item, use as a simple way of sharing visual instructions, create awesome looking flashcards to learn a foreign language, and then share the great holiday snaps upon return from said foreign location; the list is endless! You can find many more exciting and wonderful applications for Haiku Deck on the Haiku Pinterest Page. Better still, share ways you have found to use this beautiful piece of technology in your classroom, library or beyond! It is undeniable that we live in a new media age. In this age, literacy requires students to be able to make meaning from information in a wide variety of formats, one of the most prevalent being visual. The Australian Curriculum identifies the important role that visual literacy plays in contributing to a student’s overall literacy level, so much so that it forms one of the four major building blocks within the Literacy Capability. Within this context, the graphic novel is perfectly poised to provide a powerful teaching tool, which enables students to develop literacy skills. 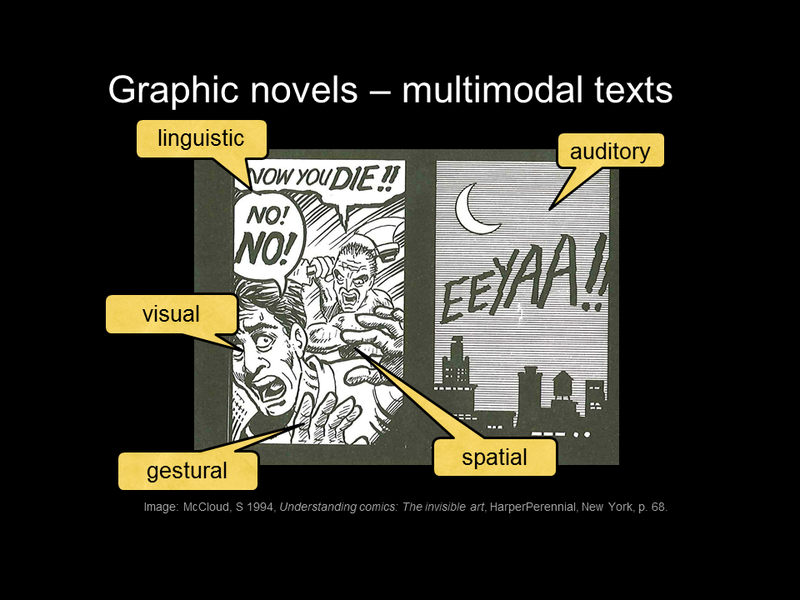 As Di Laycock identifies, graphic novels can be considered the ‘holy grail’ of literature, as they are truly multimodal texts, encompassing all five semiotic systems. All five semiotic systems combine to convey meaning in a series of panels. Thanks to Di Laycock for generously sharing her slide. Image: McCloud, S 1994, Understanding comics: The invisible art, HarperPerennial, New York, p. 68. You will note that in this quote, Eisner speaks about comic books as opposed to graphic novels. The difference is defined as one of serialisation; comics and graphic novels share the same format, however a comic is generally one part of a larger sequence, with a continuity plot that extends over multiple issues, whereas a graphic novel is a complete and extended narrative (Laycock, 2014). While we are in definition mode, let’s turn to the work of Scott McCloud whose amazing work Understanding Comics, The Invisible Art gives a terrific explanation of what distinguishes this format from others such as picture books or movies. Di Laycock’s research has led her to work with many teachers using graphic novels in the classroom. One of the things that she has noted which may make graphic novels less appealing is a possible lack of familiarity with this type of text. Many teachers and students simply don’t have the metalanguage required to ‘talk about’ graphic novels, and indeed, many may need explicit instruction as to how to read a panelled page. Click on this image & access this collection I have compiled on Amazon to learn more. Teachers of Brisbane Catholic Education may borrow any of these titles from ResourceLink. Another challenge for teachers and teacher librarians who want to introduce graphic novels to the curriculum is identifying which are quality texts. There is a growing number of graphic novels for sale, but evaluating these for use in teaching can be time-consuming and overwhelming for someone not familiar with the format. Just as there are novels that you might choose for a trashy ‘summer’ read, and others which you might choose for their literary merit, so too are graphic novels published for many different reading purposes. Thankfully there are a number of resources online which assist in this area of selection. Selecting graphic novels for inclusion in a general borrowing collection for a school library is also different to selecting texts for inclusion in the curriculum. For teacher librarians looking for advice on how to develop a quality collection of graphic novels for students to borrow, I would direct you to Di Laycock’s excellent article from Synergy (PDF download). Unfortunately at the present time there are few evaluation sites for graphic novels run by Australians for an Australian audience (if they do exist, please let me know in the comments section!). Nevertheless, there are some fantastic sites for teachers and TLs getting started – one of the best is Getting Graphic, by Canadian teacher Kym Francis. This website has an excellent introduction to using graphic novels in the classroom, as well as an extensive vocabulary page which is good for building up ‘metalanguage’ skills, as well as a page devoted to evaluation processes for choosing great graphic novels. Another fantastic source of up to date information is Comics in Education, which has a very comprehensive site, and which tweets a lot of good information for educators wanting to keep up to date in this area. Follow them at @teachingcomics on Twitter. There are other good information sites also; some of the best are pinned on my Pinterest board about graphic novels. Of course, no post on graphic novels would be complete without a few suggestions for fabulous titles to consider. Here at ResourceLink, we have been fortunate enough to be able to build up a small graphic novel collection, so I have had the pleasure of reading quite a few titles recently. The graphic novels below are now available to borrow by BCE staff! Click the image to access teachers’ notes on this title. The comic book is able to depict the events of the Holocaust in a less confrontational way than photographs or films, especially with the distancing element of the characters being depicted as animals. However, Spiegelman did meticulous research and based his drawings of Auschwitz on photographs and plans. An array of teaching resources to support Maus in the classroom is available on the Melbourne High School website. This graphic novel would be best suited to students in Year 11 and 12. Click the image for a terrific review by The Book Chook. Another graphic novel which uses anthropomorphism is the recently published An Anzac Tale by Ruth Starke and Greg Holfeld. This title retells the Anzac Story from the perspective of Wally and Roy, two young larrikins who sign up for adventure and to earn some extra money for the family. An author’s note inside the front cover notes that the animal representations were chosen either for their indigenous associations with the country (kangaroos, wombats and koalas) or for their symbolic association with the country (e.g the British Lion, or the Bengal tiger of India). Terrific teaching notes are available from Working Title Press. This retelling would be suitable for middle primary students and above. Blue tells the story of Christian, as he looks back on his youth growing up in the fictional industrial town of Bolton. While some of the language is ‘colourful’, it is necessary to the authenticity of the story, which the author describes as a combination of Stand by Me and District 9. This graphic novel has themes of racism and immigration, which lends itself to classroom discussion, and the entire book can be accessed online at Pat Grant’s website, for further discussion on how the book translates into the digital medium. Best suited for students in Year 9 and above. Click the image to go to Classical Comics website. For something completely different, Classical Comics provides graphic novel versions of many popular high school novels – and interestingly, they offer them in ‘original’, ‘plain’ and ‘quick’ text, so that readers of all abilities (and those who are time poor) can access the story more effectively. These are of beautiful quality, and well worth investigating. In addition, the titles have extensive teaching notes available. Staff of BCE can borrow packs of several of these titles which include all three text levels and teachers’ notes – Romeo and Juliet, A Midsummer Night’s Dream, Macbeth and Frankenstein. These are available in Australia through Book and Volume . Like anything in teaching, it is the pedagogy that is the most vital part of the puzzle. Don’t include graphic novels in the curriculum simply because you can; include them because they are the best tool to use. A great deal of the Australian English Curriculum focuses on multimodal texts – either working with them or creating them – and so familiarity with this format is an awesome way to develop student’s skills in multiliteracies. An example of how graphic novels might be used in a series of lessons for Year 8 is available here. These simple lesson plans have been developed by myself and our Education Officer – English, Kim Summers, as a way of introducing teachers to the possibilities in using this format in the classroom. Start just by sharing a graphic novel with your students. Consider a graphic novel version of a text you might usually teach, or better still, deepen your teaching by using both traditional and graphic novel format. Investigate having students create a graphic novel (or part of one) as a writing task. Almost all literature strategies equally apply to graphic novels, but check out this list of easy to implement strategies for graphic novels for more ideas. Teachers in Brisbane Catholic Education are welcome to borrow from our range of resources to support their investigation into graphic novels. For all other readers, check out our Pinterest Board of resources. If you have used graphic novels in your library or classroom, share your experiences or advice in the comments below; we’d love to hear from you! Eisner, W. (2008). Comics and Sequential Art: Principles and Practices from the Legendary Cartoonist. New York: W. W. Norton & Company. Laycock, Di (2014) The Power of the Panel. Workshop presentation for English Teachers Association Queensland, 31 May 2014. McCloud, S. (1994). Understanding Comics: The Invisible Art (Reprint edition.). New York: William Morrow Paperbacks. Each year, when school returns we are immediately plunged into Australia Day celebrations – and at such a busy time of the year! Below are some terrific resources that require little preparation, so you can grab and go and impress your new class with exciting and informative lessons. The ABC has a terrific page full of news and information about Australia Day, suitable for high school students, with a special focus on our Australian of the Year. Find out how Australia Day is celebrated, read about what the day means to others, and explore what it is like to be a young Aussie living in a regional area. Explore with students how they each celebrate Australia Day, and then use the Australia Day website to explore how people across the nation celebrated. This site also features Australian history, teaching resources and digital learning objects for students to complete. Celebrate by sharing some wonderful Australian literature; this Pinterest board links to a number of titles, for younger and older readers, which would be great to share, as we reflect on our heritage and celebrate all that it is to be Australian. Many of these titles are available to borrow from the ResourceLink library for those who work in Brisbane Catholic Education, or to download from our BCE Digital Library. Simple printable activities for early years’ students are available for download here. Rather than simply colouring the images in, why not have the students find photos of the flora or fauna online, and try to replicate their colours as closely as they can, or colour, cut out and create simple jigsaw puzzles to test their friends? There are so many ways to explore and celebrate Australia Day – why not share your ideas and experiences in the comments? A wonderful colleague has alerted me to the fantastic wealth of resources available on the TES Australia website; with links for Primary and Secondary learning activities, video clips such as the one below and links to other resources, it is definitely one to check out. SLANZA 2015: Lots to Learn from our NZ Neighbours!